Please check the Patterdale Parish Council website http://www.patterdale-pc.org.uk for flooding updates. 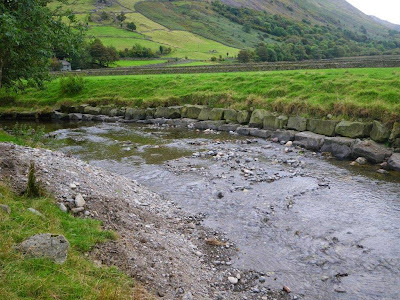 Water management in the valley (in particular the Hartsop area) is a difficult issue that no one organisation or landowner can solve on their own. On the 3rd September 2009, the National Trust organised a Public Consultation Meeting to bring together the key stakeholders (National Trust, the Environment Agency, Natural England and the Lake District National Park) to discuss with the community the various challenges and how they could find a way forward together. 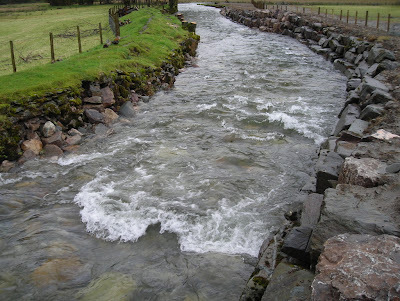 Following this the Patterdale Water Management Group was formed with the above agencies and others together with representatives of the Parish Council, local residents and businesses to develop a Water Management Plan for the Parish. Several documents, photographs etc., are included as attachments at the foot of this page and can be viewed by clicking on the required item. If you have Google Earth installed on your computer, then downloading and opening the .kmz file at the foot of this page, gives a great overview with geo-located photos of the problem areas (deterioration and repairs) over the last few years. Or to look at the photographs alone click here to view the collection. The first part of the filename identifys the section and a unique problem location, the second part is the date taken in in yyyymmdd format. Clicking on a picture gives you a larger view from which you can scroll to the next image. Also the (i) button towards the top-right of the screen will reveal details of the picture, including a description of the problem. The dry summer and autumn has fortunately been kind to the rivers and allowed us to progress works as agreed with the PWMG. 2014 was primarily one of monitoring and consolidation and I think we have been successful in that. 1. The Ullswater river monitoring group has resurveyed the beck and is in the process of mapping the results - I have seen a version of a map that shows how this might look and I have to say it was really good and should be very helpful in planning future actions. 2. The Cowbridge drainage picture refers to the tail drains that run under Cowbridge car park and the road where there is a concern about blockages causing floodwater to back up and eventually run across the road. The NT has supplied the necessary pipework (about £1000) which Eric Wear has kindly installed. This was a prerequisite before the Highways department investigated the problem more closely - I have to admit that it has been difficult to pin them down to a date for a site visit but I will persist until one is agreed! 3. 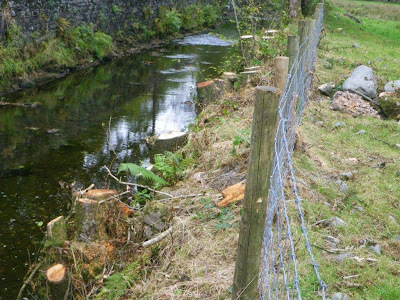 The riverbank tree coppicing programme has continued with a 100m stretch being selectively coppiced to prevent further damage to the riverbanks. Being behind a fence means that the coppice will resprout as required by the forestry licence. This work has been carried out by our in house foresters at an approximate cost to the property of about £3,000. More will happen in 2015. 4. 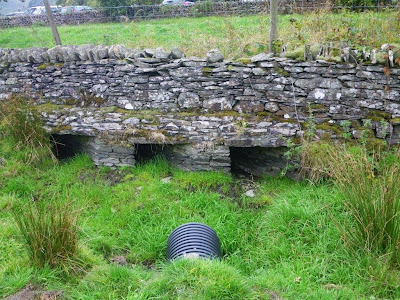 A 10m collapse on the riverbank wall below Cowbridge has been repaired by an external contractor at a cost of £4,000. Together with the coppicing work, this stretch of bank is in a much better state of repair compared to last year. 6. 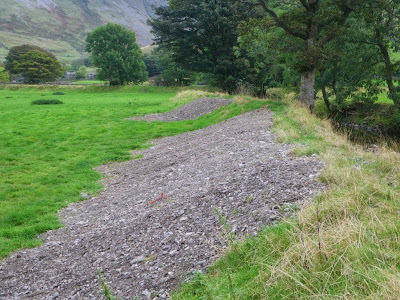 A small amount of gravel removal and underpinning of a recent repair at Hartsop Beck has taken place to consolidate an area which was in danger of being undermined by high flow water events. Work still to do revolves around small areas of tree planting in a number of locations throughout the valley and this work will be undertaken this winter. 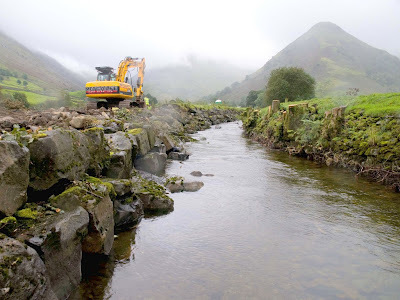 I hope that this demonstrates a continued good partnership towards river management in Ullswater and further progress being made to improve matters within a limited budget. 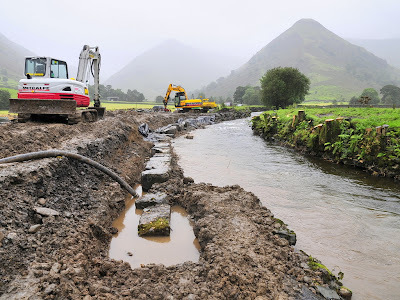 Despite the appalling recent wet weather, I am sure that many of you noticed the diggers at work in the fields below the Brotherswater Inn on NT land at Hartsop Hall. 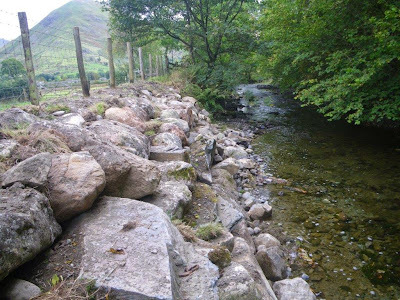 The work has been agreed by the Patterdale Water Management group to resolve the potential flood risk at that location and has been carried out by a local contractor, Metcalfes. 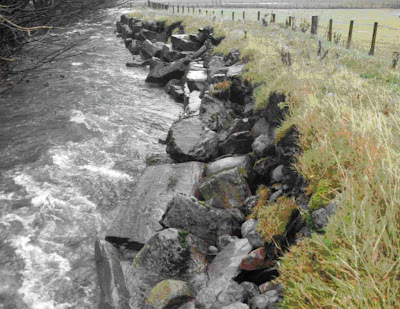 The bank had previously been repaired by the Environment Agency using large blockstones but over time this had progressively failed resulting in large stones falling into the channel. This led to a further undesirable knock on effect of narrowing the channel and causing scour of the other bank which had been in a relatively good condition. A specialist water consultancy firm, Jacobs, was asked to come up with a more sustainable long term solution to river bank management in this location which was acceptable to the water management group, the tenant farmer and the statutory agencies. The aim of this work is to protect the cultural landscape, safeguard an important agricultural field whilst at the same time allow for a measure of river naturalisation. The river bank wall has been rebuilt but set back slightly to allow additional water volume, river bank trees have been coppiced and the river has a twin flow as it exits the bottom of the field – one flow goes down the original channel with a second new channel flowing through the wetland which is designated as an SSSI and should benefit from additional wetting up. The repair work has cost £29,000 and is almost complete and the only outstanding work being the reinstatement to the field – this will be done when the land dries up! The NT will be reviewing the current situation and will be discussing future proposals with the Patterdale Water management group in due course. A few photographs of the work are shown on this page.